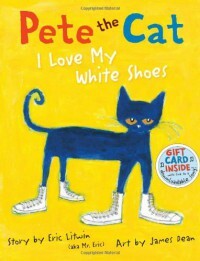 Another Pete book, this one is great for color practice when Pete steps in the many different things and his beautiful white shoes turn into different colors. I think the great thing about all the Pete books is that the bottom line is that "It's all good" and no matter what happens just keep going and singing your song. Its a good positive message for kids that you can make mistakes and it's all good. These books could also be good for teaching a growth mindset lesson.